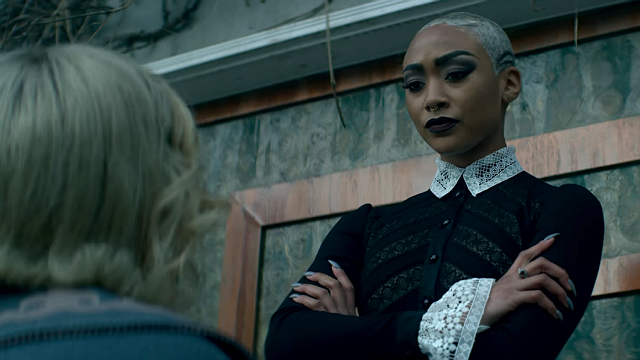 In the previous episode of Netflix’s Chilling Adventures of Sabrina, Father Blackwood threw Ambrose into a Witch’s Cell for killing the Anti-Pope and expelled Sabrina and Nick from The Academy of Unseen Arts. 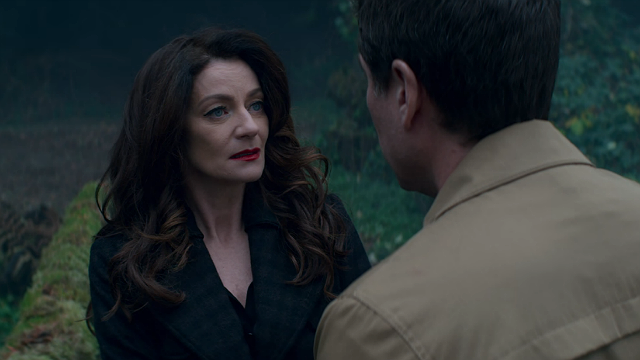 In Chilling Adventures of Sabrina Season 2 Episode 6, Hilda tried to break Ambrose out of the Witch’s Cell, but witch hunters arrived in Greendale to cleanse it of witches. 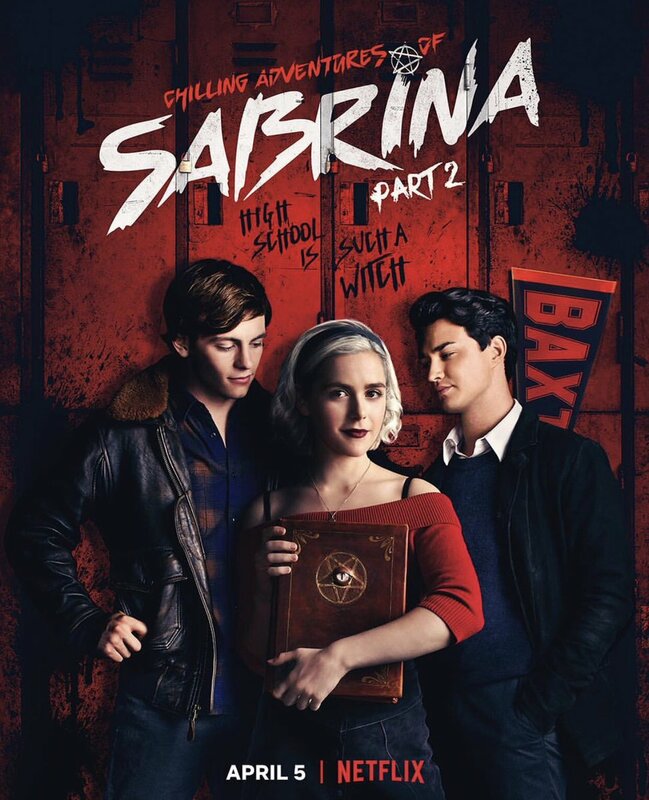 With her expulsion, Sabrina went back to Baxter High. Theo broke the news to Sabrina about Roz’s eyesight. Roz spent her school days in the library since it’s been rough for her without her sight. 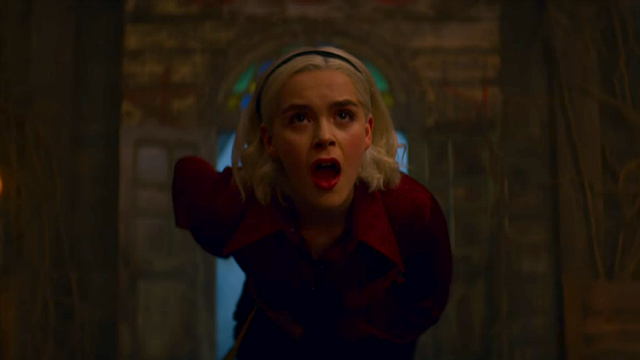 Sabrina offered to use magic to give Roz her sight back. Roz and Harvey wondered if Sabrina had taken her sight away since it coincided with them getting together. Sabrina left Baxter High, and Theo reminded Harvey and Roz that Sabrina was their friend. Sabrina found Nick getting drunk at Dorian Gray’s Room. For Nick, the expulsion was worse since The Academy was all he had. 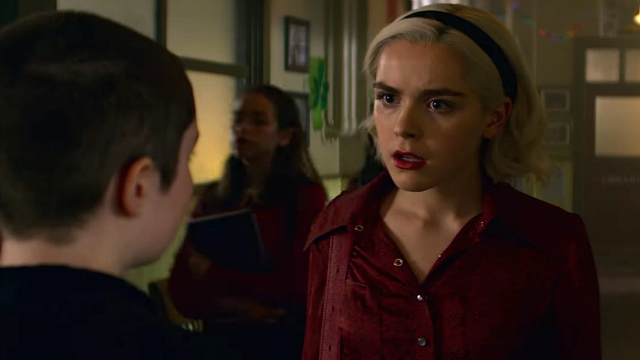 Sabrina could go back to her mortal life with her friends and Harvey. Adam asked Lilith to go to Tibet with him. He wanted to show her the world. Lilith considered escaping her Satanic duties with him. That night, Adam cooked her a roast, but Lilith found the ring she gave him in the food. The Adam sitting across from her was Satan, and she was eating the real Adam. Satan reprimanded Lilith for defying him. While Lilith was in the bathroom vomiting, she realized that Stolas was reporting back to Satan. She ignited him and vowed to take away the thing that Satan loved most. Hilda cooked a chicken to bribe the Weird Sisters into letting her see Ambrose. She suggested they eat the chicken and throw the bones to him to torment him. Prudence let Hilda in but had her visit with Agatha wearing a glamour. Dorcas, wearing a Hilda glamour, was trying to get Ambrose to confess. Both Ambrose and Hilda noticed the deception and called them out. Like Hilda had suggested, the Sisters threw the bones at Ambrose. He turned one into a Skeleton Key, which he used to unlock the Cell. Unfortunately, at the door, he ran right into a pair of witch hunters. Two weeks prior, Jerathmiel had captured Luke. He tortured Luke for information about the witches in Greendale and took his hand to open the door of The Academy. After hitting the Spellmans’, Dr. Cerberus’s, and Dorian Gray’s Room, the witch hunters who escaped converged on the Academy. When the Weird Sisters tried to kill them, they revealed themselves to be angels. Sabrina, Hilda, Nick, and Harvey went to The Academy. They found Ambrose bleeding to death so Hilda used magic to stop it. The angels had re-consecrated the desecrated church and were trying to get the witches to convert before killing them. Fortunately, Sabrina was baptized so she could enter. Though Jerathmiel shot Sabrina several times with a crossbow and the angels put a magic-blocking thorny crown on her, Sabrina rose as the Devil’s Sword. She ignited them in hellfire and resurrected the witch and warlock they killed.